I was putting together our new highchair, when Crystal wakes in terrible pain at 10:45 Friday night, April 22. She had tried to walk it off, but it only got worse. She had a hard time explaining the pain, but knew it was not right to be feeling that kind of pain. We were both very scared. Nancy came over to the house to sit with Billie, who was sound asleep, and we rushed to the hospital in our pj’s. Our 100% healthy 24 wk baby had a good heartbeat and the doctor wasn't sure what was going on. Thoughts were a torn muscle in her abdomen, and if so, would be better in the morning. So they admitted her and tried to treat the pain. Saturday morning resulted in no decrease of pain, so they did a CT scan where they found abdominal bleeding. They thought it may be an appendix rupture or twisted ovaries, but the pint of blood in her stomach made it unable to tell. So very quickly an exploratory surgery was planned. Once they got in there they found her uterus had ruptured and she had placenta accreta, which is when the placenta grows through the uterus wall and into other organs. In Crystal's case, it also grew into her bladder. So they were forced to make a very large incision from the top of her belly to the bottom, deliver the baby, do a hysterectomy, and repair and remove part of the bladder. Harper Grace was born Saturday at 4:25 PM, at only 24-weeks gestation. She weighed 1lb 6 oz and is 11 inches long. 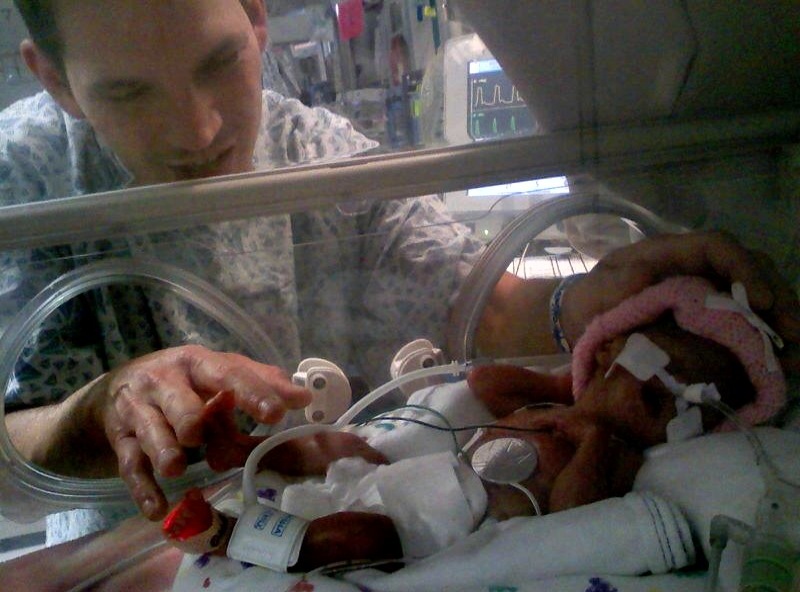 She is in NICU at Children's and is on a ventilator but is doing very well, considering all things. Both girls have some serious around the clock recovering ahead. We hope Crystal can meet Harper for her first time by mid/end this week, soon as the NG tube that Crystal has to empty her stomach contents can be removed. 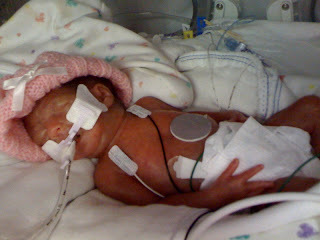 I bring back video & photos of beautiful Harper from my 3 to 4 NICU visits per day. We got very lucky with Crystal, and I pray nonstop for my Harper Grace miracle. Since he wrote this, late Monday night, I think, a lot has happened. Yesterday they were able to remove the NG tube from my stomach and I was finally able to take the trip over to Children’s and meet my daughter, OFFICIALLY! It was a God-touched moment, that is the only way I know how to describe it. She is so amazing. So tiny, so beautiful. I was able to hold her hand, and touch her leg. The nurse said all of Harper’s stats were the best they had ever been when I was there! She said she knows her momma! She could smell me and recognize me somehow. It is just so amazing. I also took some “mommy milk” and put it on a Q-tip and fed it to her. Her little mouth is so tiny, a Q-tip barely fits in it! She loved the milk and it was so amazing to bond with her like this. I feel so absolutely blessed to be Harper’s mommy! It helped me so much to just see her and know how well she is being taken care of. I get to go see her in a couple of hours, so I will blog again after that visit. Thank you for your continued support and prayers. Ultrasound News, Tallent Shows, and Graduation...OH MY! Sorry I waited almost a week before updating about our latest doctor appointment. We went last Tuesday for an ultrasound. I was a little angry and very sad for a couple days after, but then I got over it and moved on. The doctor visit went pretty good. Unfortunately, the placenta previa did not move, at all. I was so devastated. I just knew it was going to move over that four weeks while we waited with bated breath. I was absolutely convinced it would be completely corrected at our last ultrasound and when it wasn't, I was shocked. I struggle with my prayer life, but I know I struggle and I work on it. I had put the placenta previa in God's hands and I had let him have it, all of it. I guess that is why I was so angry when it hadn't moved even a few millimeters. I know I shouldn't be that way, but I am only human. So I had a pity party for a few days, and then I got over it. Bottom line, nothing is different. As long as there is no bleeding, everything is fine. 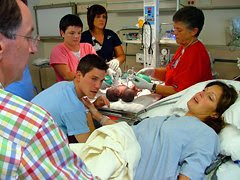 There just is no exit route, which doesn't matter if you are planning a c-section, anyway. The doctor said there is still a chance that it could move over the next few weeks, and he said our odds are still good that it will. Like I said, it doesn't matter either way as long as there is no bleeding, and there won't be any bleeding as long as I don't have any labor to open my cervix. So it really is fine. I carried Billie to full term with no problems, and I carried the boys to 34 1/2 weeks, so the odds are really in my favor that I will carry this baby to term. I still pray that the previa corrects, but if it doesn't I am not going to throw such a fit again. I did insist they change me from the Lovenox to Heparin. While on Lovenox, you can't have an epidural so if I did need to deliver early or quickly, they would have to put me to sleep to do the surgery. However, on the Heparin that is not the case. You have to wait 4 hours since your last Heparin injection for the epidural because it has a shorter half life. The down side is that the Heparin is twice a day instead of once a day, and they will have to check my platelets closer, plus there is a higher risk of osteoporosis. But I am taking supplements to hopefully combat that and I have blood work every two weeks to check the other stuff. The upside, besides being able to have an epidural instead of being put to sleep, is that the Heparin doesn't hurt nearly as bad as the Lovenox! That was a very nice added bonus. It does bruise just as bad, if not worse, but that isn't the end of the world. Overall, everything is really fine. We did not find out the gender, although I really wanted to. Matt stuck to his guns about it. I thought it was a girl in the beginning, but now I feel like it is a boy. I don't know why, it is just a gut feeling. I guess I can say I was right either way now! I will let you know if I change my mind again. Any one have any guesses for me? I do have a recording of the ultrasound that Bill is putting on a DVD for me, so once I have it and Matt compresses it for me, I will post it here for your viewing enjoyment. It wasn't as great of a shot this time, maybe because I was so angry immediately, or maybe because of the way the baby was positioned. We didn't ever get a good look at it's face because it was sideways in my belly and facing the back, too. She tried to get a 3D picture but just wasn't able to make it work. Maybe next time- we have another ultrasound in just 3 weeks. I had a wonderful shower Saturday. My wonderful cousin Kellee threw it for us. We had a big turn out and it was so nice to see so many people I haven't seen in a very long time. We received so many beautiful gifts. It was such a wonderful day and wonderful party. We are very blessed to have so many supportive friends and family. Once Matt puts some of the things together, I will post a few pictures of the fun baby "toys" we got! Billie sang at the 4H talent show today at school. It was just for the fourth grade, and she did amazing! She sang "The Climb" by Miley Cyrus and her "Crandpa Williams" played the piano for her. She got a blue ribbon, which was the highest ribbon available. She was very proud of herself and very excited. She loves to perform. She doesn't get nervous even a little bit, it is truly a blessing and amazing. Matt recorded it for us so once I get a chance, I will post the video. We just used the iPod to record it, so the audio quality isn't very good, but you can still tell that she did a great job. Graduation is fast approaching, along with deadlines and final exams. I have 8 more days of classes, and only 23 days until graduation day! It is so hard to believe, but I am so so excited.